Born on July 18th, 1963 in Paris (France), graduate of the HEC (Hautes Etudes Commerciales) and the ENA (Ecole Nationale d’Administration), Nicolas Dufourcq began his career at the French Ministry of Finance and Economics before joining the Ministry of Health and Social Affairs in 1992. In 1994, he joined France Telecom, where he created the Multimedia division, before going on to chair Wanadoo, the firm’s Internet and Yellow Pages subsidiary. After joining the Capgemini Group in 2003, he was made responsible for the Central and Southern Europe region, successfully leading their financial turnaround. In September 2004, he was appointed Chief Financial Officer of the Group and member of the Executive Committee. In 2005, he was named deputy Chief Executive Officer in charge of finance, risk management, IT, delivery, purchases and LEAN program, in addition to the follow-up of the Group’s major contracts, since January 2007. 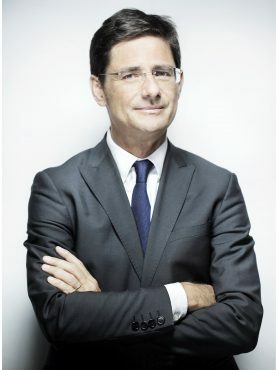 On February 7th, 2013, he is nominated Chief Executive Officer of Bpifrance (Banque Publique d’Investissement), by Mr. François Hollande’s government.